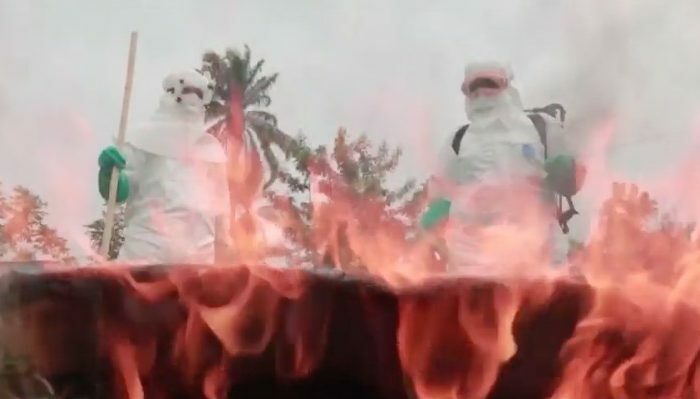 The deadly Ebola epidemic in the Democratic Republic of Congo (DRC) has now exceeded 1,000 cases and claimed the lives of more than 600, the country’s health ministry confirmed on Monday, March 25. But the situation has been made worse with attacks on treatment centers by militant Islamists in the region who have been entrenched in Eastern Congo’s 25-year-long civil war. The 1,009 cases are part of an outbreak that began in August last year. Of those, 944 have been confirmed and 65 are considered probable. The total death toll stands at 629, of which 564 are confirmed and 65 are probable, reported CNN. It is the second worst outbreak in history, surpassed only by the 2014 Ebola outbreak in West Africa which killed more than 11,000 people, according to the U.N.’s World Health Organization (WHO). Ebola is a deadly and contagious virus that spreads to people from wild animals and is transmitted among people through direct contact, such as through bodily fluids or broken skin. Over half of Ebola cases are fatal. The disease causes fever along with diarrhoea, severe vomiting, bleeding, and rashes. On average Ebola patient has a 50 percent survival rate, making it one of the deadliest known viruses in the world. But advancements in the treatment of the Ebola virus, such as a trial vaccine, experimental treatments, and mobile units for treating patients have meant that health workers have been better prepared for the latest outbreak. The virus has been prevented from spreading into neighboring countries and there have been no reported Ebola cases outside of the DRC’s provinces Ituri and North Kivu, the U.N. health body confirmed on March 23. Only 10 percent of those eligible for the vaccination have refused treatment, the WHO said, and more than 80 percent of those who become fatally infected accept arrangements to be made for safe and dignified burials—a key to preventing the spread of the disease that remains contagious for several days after death. The WHO cited “increased security challenges, including the recent direct attacks on treatment centers, and pockets of community mistrust” as causes for the recent reported weekly rate of confirmed Ebola cases, following several weeks of decline. Ebola treatment facilities have been attacked in recent months by the radical Islamist group the Allied Democratic Forces (ADF), according to the International Institute for Strategic Studies. The group was founded in Uganda in 1989 to overthrow right-wing Ugandan President Yoweri Museveni and has been active in the region for decades. International health NGO Doctors Without Borders (MSF) were forced to suspend its humanitarian efforts after two attacks on treatment centers in North Kivu—an ADF stronghold—in February amid the ongoing political crisis. Local residents told Deutsche Welle that there have been rumors circulating in the community that Ebola is being “deliberately spread” by the DRC’s central government or the DRC’s former left-wing President Joseph Kabila, who lost power in January after 18 years of rule, as a weapon of war. Other rumors among the community that has a deep mistrust of the government and foreigners have claimed that the disease is being “spread” by the aid organizations working in the area. WHO’s Dr. Peter Salama told AP that there have been problems resulting from the makeshift “tradi-modern” health centers, which have been offering both traditional and modern treatment that have been linked to new cases of infection. Misdiagnosis and lack of proper hygiene have also been an issue, he said. According to WHO, of the 51 reported Ebola cases among health workers working in the region, 17 have died. An attack on a treatment center earlier this month saw a local police officer killed, according to CNN. “As we mourn the lives lost, we must also recognize that thousands of people have been protected from this terrifying disease,” Dr. Matshidiso Moeti, WHO regional director for Africa, said in a statement. Ebola is endemic to the DRC. The first outbreak of the virus occured in 1976.